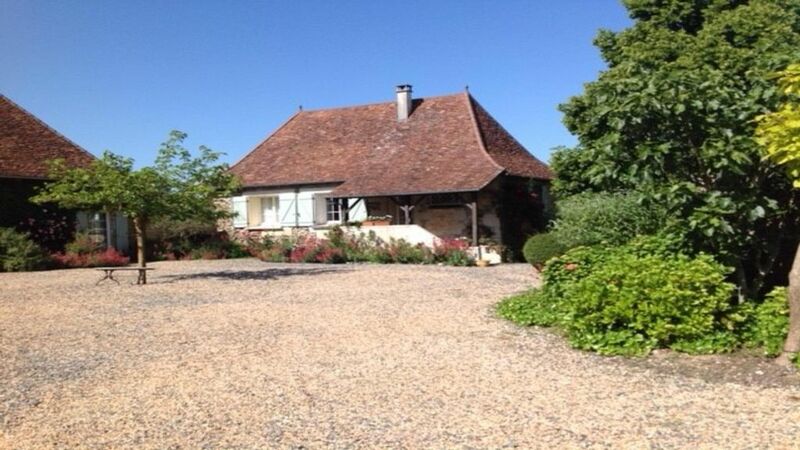 LaTuiliere is a beautiful secluded tasteful gîte in the north Dordogne. The house has recently been completely and in authentic style restaured. The terrace adjacent to the kitchen gives a great view over fields, valleys and forests. The beautiful hillie area with many castles and medieval villages and towns gives a picture of France through the centuries. The house is for 4 people with 2 double bedrooms, bathroom and separate wc. On the 18 hectare site the swimming pool (16x5 mars.) is located near the gîte. It has a lovely terrace with loungers. The house of the landlords is located on the cour where the gîte is. At 3 kms. distance is the village of Excideuil, where you will find supermarkets, restaurants nd terraces. In the immediate vicinity you can play golf, go horseback riding, cycling, walking, tennis, canoeing, waterskiing, visiting castles and a nice French market almost every day. Day trips can easily be made to Sarlat, Bergerac, Perigueux, Limoges and Pompadour. The world famous caves of Lascaux and Tourtoirac are at resp. 30 and 15 kms. distance. In the summer there are musical events everywhere. Nearest airports are Bergerac and Limoges. It is a lovely house in a attractive environment, especially peace, space and many bright star nights.